There is a new phenomenon occurring in classrooms, workshops and meetings. It is called back channeling. This refers to participants in a event communicating and collaborating with technology to take notes, ask questions and reflect in real-time. A great tool to accomplish this is the website Today’s Meet. In order to get started you visit the site, create a room and send the link to the room to the other participants. The link to the meeting room can be posted on the board, linked to a teacher website or emailed to a group. The participants can immediately start a live chat. The results of the chat stay online for the period of time specified. They can also be copied to a Google Doc and shared with the rest of the class. This technology could be very useful as a way for a class to take collaborative notes and pose questions while viewing a media clip, a speaker or a class lecture. Instead of having students sit and watch a media clip or longer video they can be engaged and interact with it. The teacher may post a couple of thought provoking questions for the students. While watching the video the students may use Today's Meet or a Google Doc to document their answers to the questions. By adding Q1 or Q2 to the start of the response, the teacher and students will be able to identify what they are responding to. Students may also comment on what they are viewing and add questions and reaction that they have. Typically it is difficult to get students to take notes. When using this technology and asking them to multitask the students actually respond. As a result, the online documentation of the collaborative conversation allows the teacher to see what the students understand, what they do not understand and what topics require further discussion. Today's meet could also be used during video conferencing sessions with other schools or subject area experts. Students from both classes may take detailed notes regarding the event. These notes are then viewable online for everyone to review. They may also post questions that the speaker may access and address during the presentation. 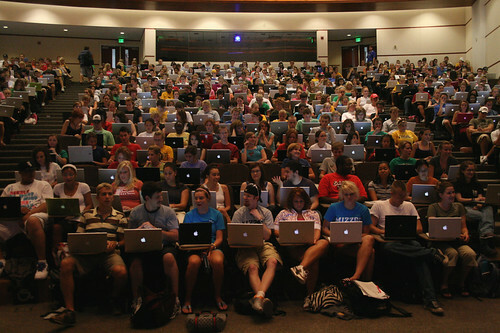 Many schools have utilized student owned electronic devices to maximize student access to back channeling. In some classrooms , that have only a couple computers, a few students are assigned the role of "class scribe" for the day. They are responsible for collaborative note-taking. These notes are then available online for the class to share and discuss.